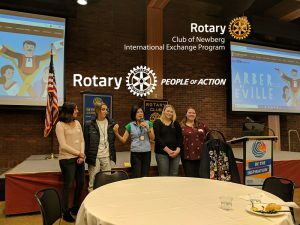 Newberg Noon Rotary Club Newsletter for March 20, 2019 – With the AUCTION, our primary fundraiser, coming right up, there are LOTS of pictures this time, thanks to Auggie and Corey! Our GREETER today was Deborah Cathers-Seymour. AUCTION EXCITEMENT IN THE AIR!!!! A little socializing and pre-Auction discussions, at the Cultural Center before the meeting got officially started…. THEN…..our always EXCITED…always INSPIRATIONAL…President Om….opened the meeting. Geoff Gilmore’s guests were GFU artists Tyler and Sara….and Denise Bacon’s guest, Chris. Dr. Stan led us in the PLEDGE. 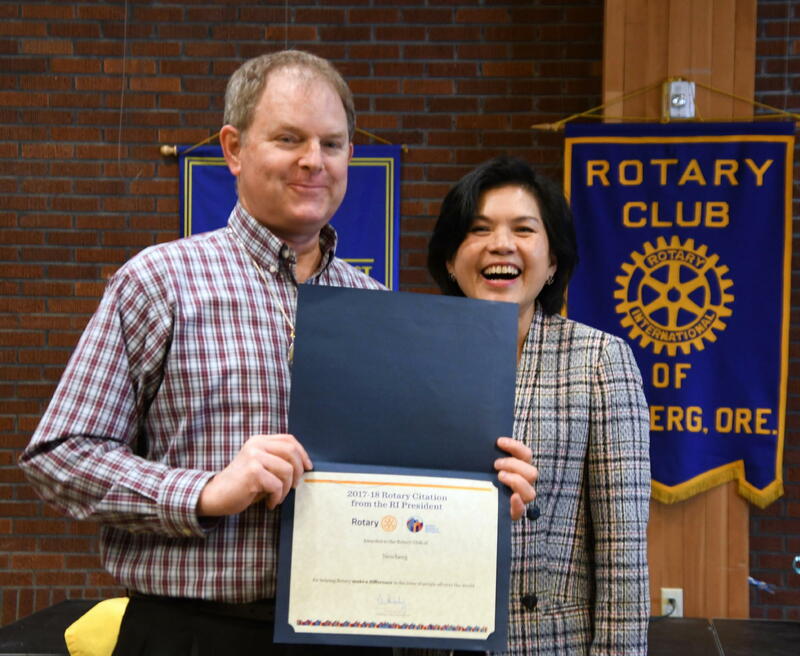 Auggie gave a brief report…a Rotary Moment, if you will, on the Dental Project in Guatemala…and how many lives our efforts impact ongoing. 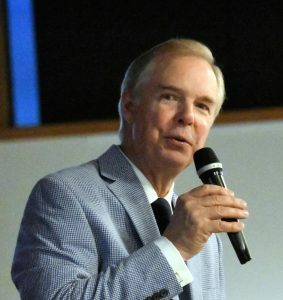 Jim McMaster reminded us that the 3/27/10 meeting will be at the Ewing Young Distillery…north off Highway 240 about three  miles west of Newberg….and NOT at the CCC. There is good signage on Highway 240 where you turn north to go to the distillery….and plenty of parking near the veterinarian center. 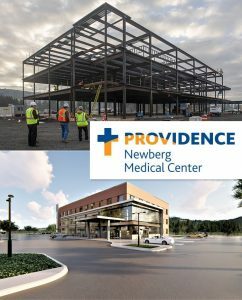 The street address is: 18715 NE Highway 240, Newberg. Our presenters at the distillery will be Doug & Bev Root. 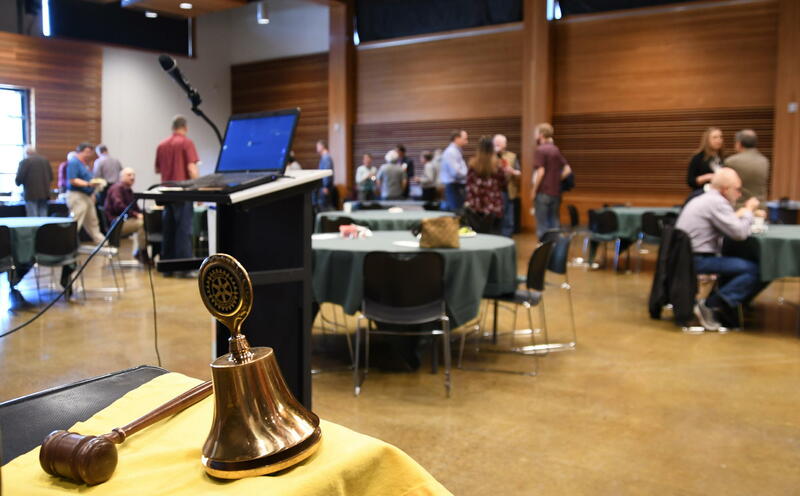 Shannon B. called for the monthly Membership Committee meeting to be at the distillery at 11:30 – Noon…before the meeting…and…. 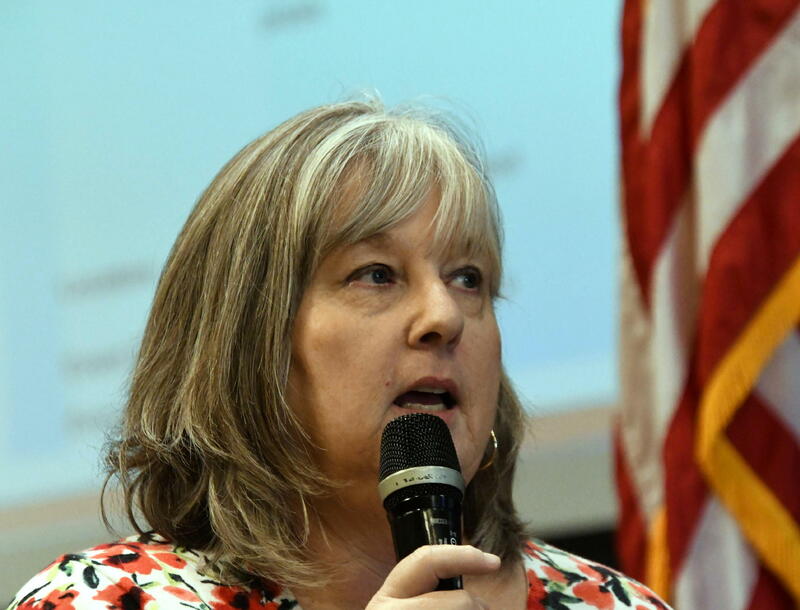 Leah called for an Auction Committee there right after the regular meeting time…so 1:00 – 2 PM. 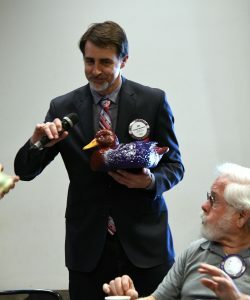 New Rotarian, Dr. Joe Morelock got right into the Newberg Rotary “swing of things” and ably handled the DUCK today….reminding us that the Duck proceeds from third meetings of each month go toward Polio Eradication. This encouraged many present to dig deep…some even more than once! 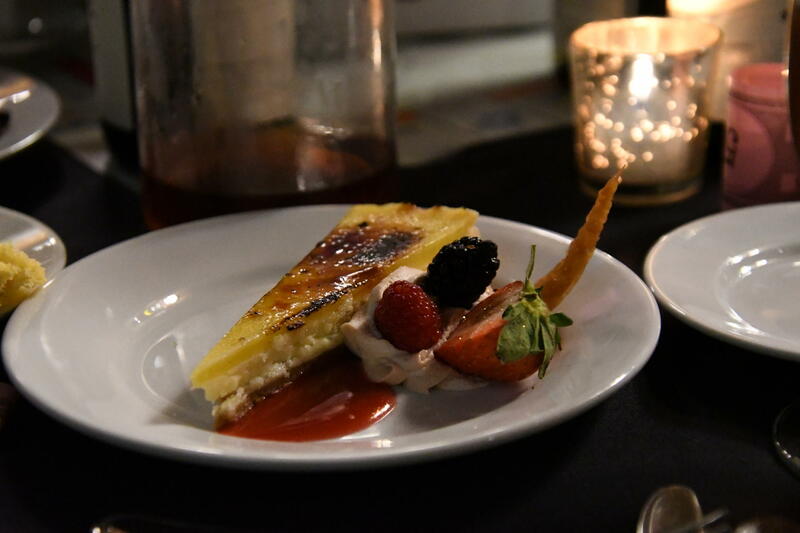 And stories abounded from Leah, Mike C., Paul [“No honey left!” If you don’t understand this…ask Paul to explain! ], Todd, Augggie, Jim Mc., Geoff G., Walter W., Ralph K., Prez Om, Yours Truly with two Tim Leatherman stories]…and Corey Z. with a couple of recollections from his recent PETS experience in Seattle [for you new Rotarians, P.E.T.S. is Presidents Elect Training Seminar….required training for clubs’ Presidents-Elect]….especially the evening PARTY after the day’s training sessions concluded! AUCTION ACTION! AUCTION ACTION! AUCTION ACTION! Auction Co-Chair Leah took the floor and encouraged each and every one of us to make our volunteer contribution to the Club’s primary fundraiser. Only 4 days left!….and she reviewed several key matters and reminded us of the Silent Auction items’ sorting on Friday afternoon, as well as the Set-Up on Saturday AM starting at 9….reiterating that Mike Donahue was to be the Auction’s Master of Ceremonies…and McMinnville’s Brian Cain the Auctioneer…for the LIVE AUCTION. 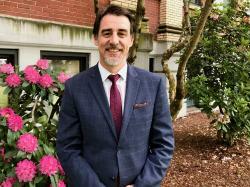 AUCTION NEWS FLASH! As of the creation of this newsletter, the AUCTION is now HISTORY! And it was a TERRIFIC SUCCESS! 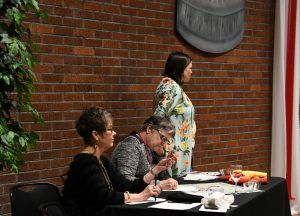 Linda Potter and Lacey Carroll were FANTASTIC…seemingly always under control…at organizing all the auction item details….and their displays. Here we have Linda, Paula R., and Beth P. keeping tabs on the activities. 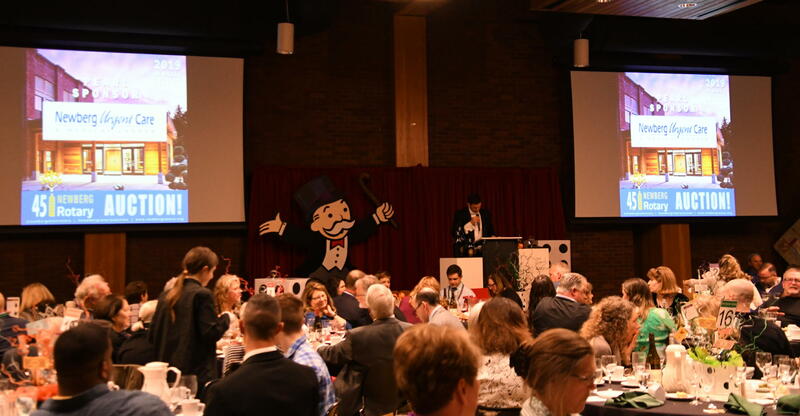 Kudos to Jan Winder and your Decorating Committee/crew, the DECOR was outrageously/exquisitely SPOT ON to the MONOPOLY theme! 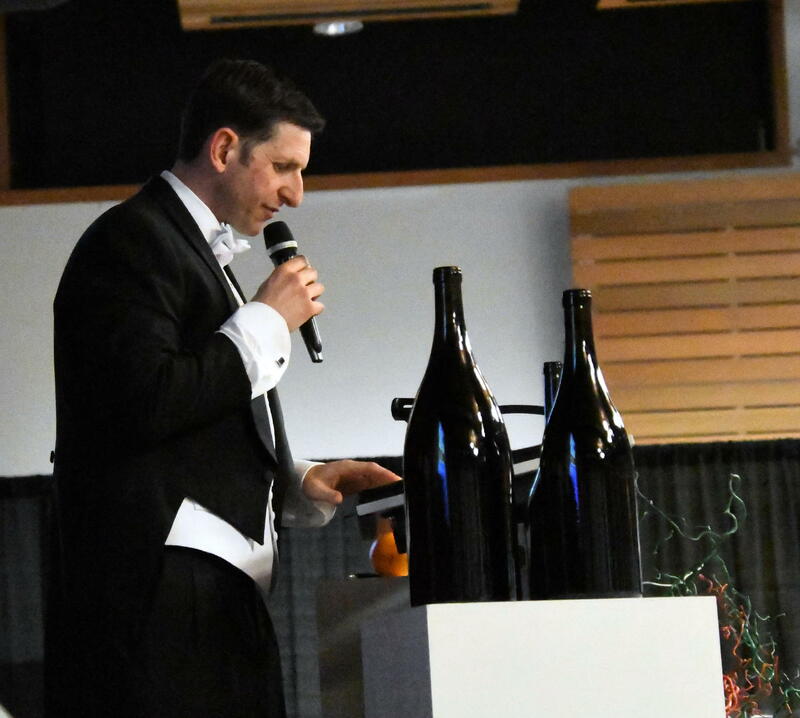 Mike Donahue was our able and eloquent Master of Ceremonies for the LIVE AUCTION…and seemed to be having a terrific time himself…and obviously INSPIRED by President Om! 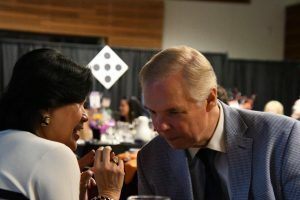 The Silent Auction displays encouraged the crowd to not only look closely at everything offered, but also to socially mingle and have a GREAT TIME! 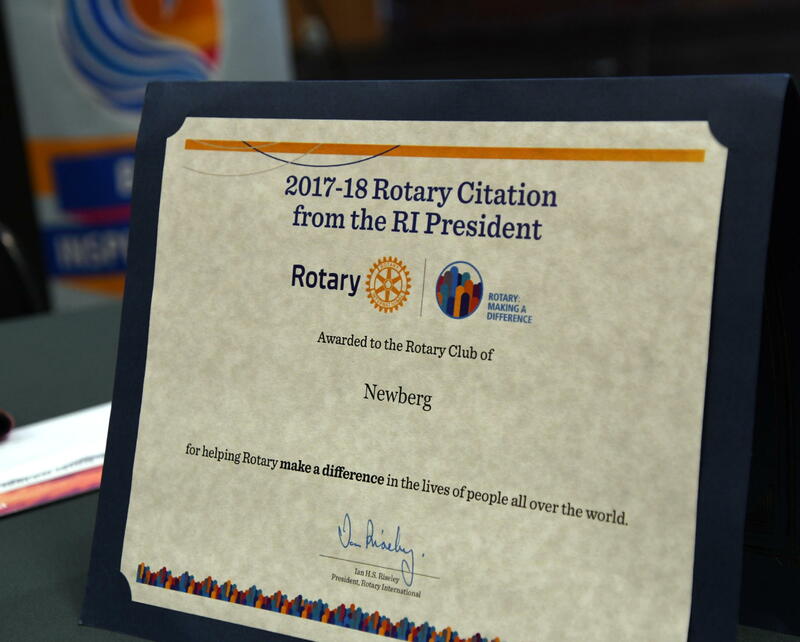 All the VOLUNTEERS…Rotarians, NHS Interactors, Helping Hands, friends, families, et al…did their parts to make the evening a GALA SUCCESS! Although the FINAL numbers are not in yet on the SILENT AUCTION, there were bids galore! THEN…with the definitely-not-so-silent LIVE AUCTION….and led by our Auctioneer Extraordinaire, Brian Cain, the action was nearly frenetic! At one point Leah announced that we were $15K short of our $50K goal on the scholarship funding…and we went to a “‘paddle” auction to make up the difference….and when that session closed we were a mere $50 shy…so with very little extra encouragement, we got a final $50 from someone in the audience to push us to the top! And our AUCTIONEER, Brian, an educator from McMinnville, was ABSOLUTELY FANTASTIC! Thankfully, he’ll return next year! 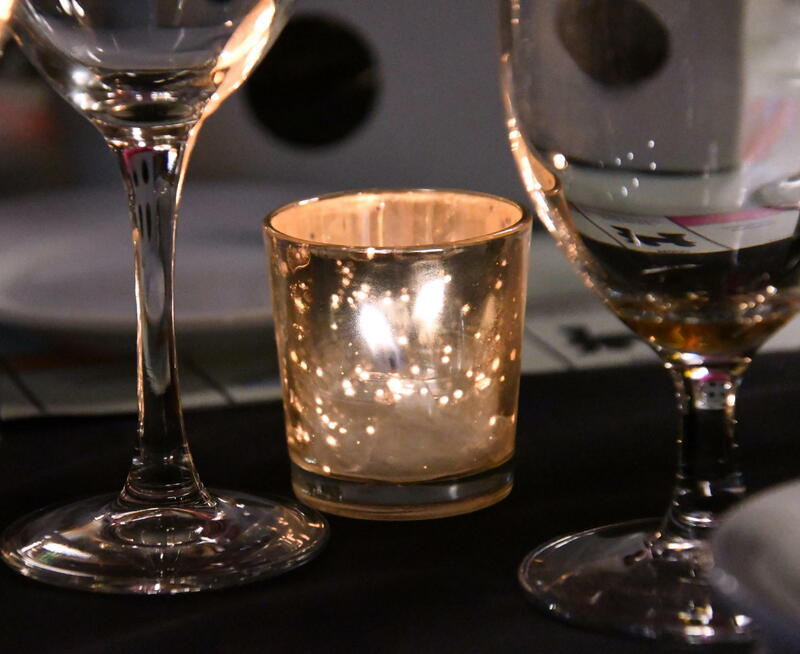 From Co-Chair Leah….a preliminary financial report: “Our gross is $128,379. Of that $17,150 goes to Helping Hands for the paddle. 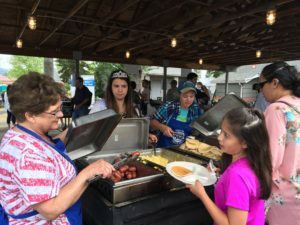 We also raised $15,000 that is dedicated to add to the Foundation scholarship budget of $35,000 for a total of $50,000 for the 2019 graduates. 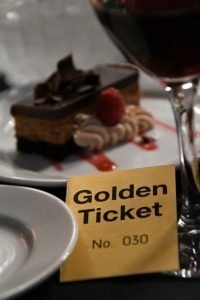 We sold all $100 Golden Tickets so $10,000 goes to support club activities and that was a big thanks to the Interacters who sold them during the silent auction and our Auctioneer who really pushed to sell those last few tickets before we started the auction. PDG Tom Markos won and he took home the beautiful Romona Youngquist painting for his Golden Ticket prize. 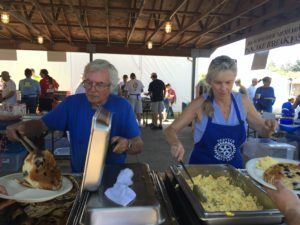 AUCTION ACTION…is ROTARY in ACTION…..it’s what Newberg Noon Rotary does…and has been doing well for 45 years…to support philanthropic projects locally, regionally, and internationally.